"Edit PDF files, keeping only the pages you want"
You don’t need expensive software to edit the Adobe PDF documents. Here we present a free alternative you might be interested in, called PDF Jumbler. It will enable you to rearrange the pages of your PDF without any problem, as well as delete the ones you consider unnecessary and even merge additional ones. PDF Jumbler is a Java application, as such it comes with the JAR extension and needs to be opened with Java, which might need to be set up if that extension isn’t associated on your system yet. But, once this step is completed, you will get an easy-to-use application with a graphical interface supporting dragging and dropping the PDF pages and documents you consider to be processed. 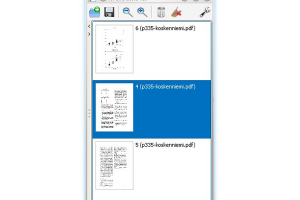 So, if interested in manipulating existing PDF files, reducing the size of large manuals for instance, consider proceeding to the download of this dedicated utility.